Rhodes, the largest of the Dodecanese islands, is not an ordinary holiday resort but a cosmopolitan place of international reputation. Indeed, this relatively limited space, endowed with innumerable natural beauties, is rightly considered a tourists' Paradise. Holidays here are not restricted to the three summer months, as the sunny period lasts much longer. In Rhodes everyone can choose their preferred type of holiday - the intensity of an excellently equipped major resort or the peace and quiet of a small, traditional sea-side or mountain village. Swimming in the crystal-clear waters of Rhodes is equally fascinating on populous beaches or on isolated pebbled sea-shores. Lovers of history will be drawn to the remarkable monuments all over the island, signs of its long past. Those who prefer mobility will find an adequate network of roads enabling them to reach almost every corner of the island. Daily air and sea communications with other islands, numerous tourist agencies open limitless horizons to the traveler. By its present reality, Rhodes would resemble a rose (rhodon in Greek) rather than the mythical nymph after whom the island was allegedly named. 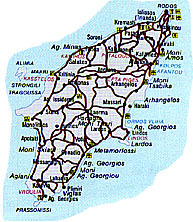 CLICK ON A TITLE TO EXPLORE RODOS!